If you have a ton of different interests, you might be struggling to decide what you want to do with your life. I totally understand, and I still have those days, too. Choosing what you want to do every day is tough. We are lucky enough to live in a world where you can do just about anything to make money. More and more people are starting their own businesses or working from home. New jobs show up regularly. We are doing things that couldn’t be done even a decade ago. This post is going to show you how you can do what you love as a career without having to choose just one thing. 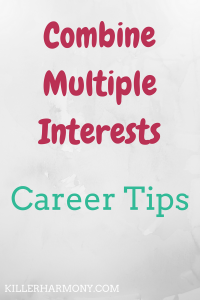 If you have multiple interests that all fall into a similar category, consider a business. If you love art and teaching, maybe you could start an art studio where you teach people to do what you do. As a musician and writer, I would love to write about music in addition to playing and teaching. Write a list of everything you like to do and see if any overlap. If you have some unique ideas, you could be really successful! Self employment is scary for some, but it could lead to a more fulfilling life. If you don’t want to be your own boss, working different part time jobs could be a good option. You can find a job or two that focus on your different interests. Maybe one job is as a graphic designer and the other is a customer service position. This choice might also be for you if your favorite things don’t quite overlap enough to make for one career. With part time jobs, you will lose out on certain benefits of full time employees, but it is a way to keep up with what you love. If you have a dominant interest that overpowers others, make those less important ones hobbies. Yes, it can be hard to give up your dream of being a rock star, but if something is not super realistic, keep it as a hobby or side hustle. When picking a career, some sacrifice needs to be made. If you really want the stability of a single full time job, you might have to give up one or more of your career goals. It’s tough giving up on an idea or dream to pursue another, but it’s one of those tough choices we all have to make at some point. When you have different interests but don’t want to quit everything, try something as a side hustle. When I graduate, music will not be my full time career. I know that I will have to spend my free time working to improve my skills and make a career out of it. If that sounds like you, side hustling while working a day job could be a temporary solution. You can make some cash off of your passion while still being able to pay the bills. At the start of your career, things won’t always go as planned. You have to be prepared for things to go wrong. Maybe your business doesn’t take off. Maybe you don’t land your dream job. Or maybe you have to move back home. We live in a world where many things are possible, but we all have to start somewhere. Even if that’s your parents basement. Just know that everything that happens is meant to be. Do you have multiple interests? What are your tips for creating a career? Let me know in the comments or on Twitter (@HannahHaefele)!